As a native New Yorker, I was built strong. I spend my days coaching my athletes, training clients and pushing myself to my limits. When I am not pushing my physical limits, I enjoy food, travel and anything active. I am a cancer survivor. In 2015 I battled stage 3 colon cancer. After serious surgery and 6 month of chemo, I am 100% cancer free. I am back training and racing and I feel stronger and faster than before. Andrew Kalley is a motivator and creates an environment for his athletes to grow and transform. 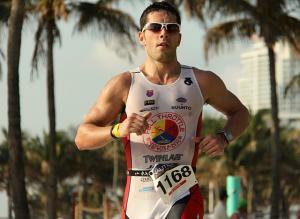 Triathlon became a passion when he joined Full Throttle in 2005. He has spent the last 12 years coaching athletes of all abilities - from beginners to elites - and for every distance - from sprint races to full Ironman. A dozen athletes have qualified for the World Championships under Andrew’s guidance. He has also been a Personal Trainer for 15 years, and firmly believes in strength training for weight loss or gain, injury prevention, and to build power while endurance racing. Andrew is fully dedicated to the success of his athletes, and encourages them to make healthy choices in training, nutrition, and racing so that they can put their best selves forward at the starting line. Andrew is also an elite endurance athlete. Some of his athletic highlights include: 7x member of Team USA for the ITU World Championship; 12 overall victories including the NYC Triathlon, South Beach Triathlon, and Montauk Mighty Man; Race Across America finisher and overall fastest team to cycle across the country; and a 4:36 at the Fifth Avenue Mile. Success. Coach Andrew Kalley has been notified of your message.